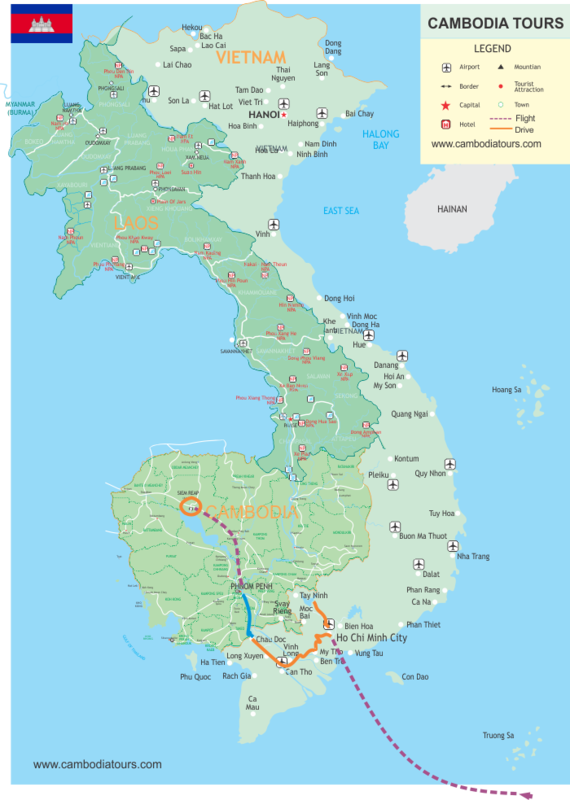 Cities to visit: Saigon - Cu chi- Cai be - Can Tho - Chau Doc - Phnompenh - Siem Reap. Price from: $1250 - Book now! Welcome to Saigon- the Vietnam’s bustling, vibrant and financial hub. Upon arrival at Tan Son Nhat International Airport, you will be met by our guide and driver for greetings and hotel transfer. Enjoy the rest of the day at your leisure to recover from jet lag and explore the city on your own. After having breakfast at the hotel, our guide and driver will meet you at the lobby for the transfer out to the Cu Chi tunnels, mysterious, once-secret tunnels used as supply routes, hospitals and living quarters by the Viet Cong during the Vietnam War. These subterranean passageways outside Ho Chi Minh City are a tiny part of a huge network that extends through much of Vietnam. your own account), transfer back to the city where you will visit the city key sites such sites as the Reunification Palace, the War Remnants Museum, Notre Dame Cathedral, the Old Post Office and Ben Thanh Market. Drive back to your hotel and enjoy the rest of the day at your leisure. Optional tour: tonight, perhaps you can take part in the “Vespa tour Saigon at night” or “Saigon cruising” or simply relax on your own. Please kindly contact our travel consultant for more details and price. After breakfast at your hotel, our driver and guide meet you at hotel for 2 hour drive to Cai Be where you will explore the Mekong River by boat. Cocochine boat embarkation at 12:00 followed by a welcome drink and check in cabin. You will have lunch onboard while cruising to Can Tho – the Mekong Center via the fascinating Cho Lach and Tra On. Up to river tide, disembark and make a pleasant walking or biking on the footpaths of the countryside to discover tropical fruit orchards and the locals’ activities, especially some orchards with its famer. When reaching Tra On, enjoy the magnificent sunset on the river. Leisurely cruise up the Mekong River while enjoying the beautiful sunset with the aperitifs. A wonderful day with picturesque ferry crossings over Mekong River branches. Dinner and overnight on board in Tra On. The noise of the floating market wake you up early in the morning. After breakfast, the cruise continues to Can Tho. Enjoy the magnificent sunrise on the river. Leisurely cruise up the BASSAC river while enjoying the beautiful scenery. Arrive Can Tho, a small shuttle boat will take you explore the Cai Rang market one of the most bustling floating markets in Mekong Delta with hundreds of small boats barging and jostling for space as owners attempt to sell their goods. And through the palm-shaded creek to see local houses and green orchards. 10h00am: disembark and say goodbye with crews. Our driver waits for you at the dock and transfer you to Chau Doc. After breakfast, check-out the hotel then travel by speedboat up the Mekong to Cambodia’s capital: Phnom Penh. The total trip takes about four and a half hours (including visa formalities). Visas are easily obtained at the border between Vietnam and Cambodia and cost (including the processing fee). Your guide will meet you at the dock in Phnom Penh and take you to the hotel. Despite its recent turbulent history, Phnom Penh’s wide tree-lined boulevards and faded colonial mansions hold an undeniable charm. After lunch (your own account) at a downtown restaurant, take a leisurely tour to visit National Museum, the Royal Palace – home to the royal family and the Central Market. Enjoy breakfast at hotel then continue to explore our capital. Start the day learning about the Khmer Rouge and Cambodia’s recent history on a guided tour of the Tuol Sleng Genocide Museum and the notorious Choeung Ek “Killing Fields”. Then try out your bargain skill in Russian market. Later in the afternoon, our driver will take you to Phnom Penh airport for your flight to Siem Reap. Upon your arrival, meet our guide and transfer to your hotel in center. Enjoy an entire full day devoted to the mystical and ancient Angkor Temples. After an early breakfast at the hotel set out to Angkor Thom’s imposing South Gate, topped with the four serenely smiling faces of Avalokiteshvara. Next, visit Bayon Temple, the Elephant Terrace and the Terrace of the Leper King. Leaving Angkor Thom by the North Gate, travel to Preah Khan (Sacred Sword), one of Angkor’s largest temples, constructed in the 12th century by Jayavarman VII. After lunch at your own account, continue to visit the mystical, jungle-entwined Ta Prohm Temple. To avoid the crowd, we then take the back entrance to the most famous Khmer temple: Angkor Wat, first constructed as a Hindu monument and later dedicated to Buddha, Angkor Wat is the largest temple and finest example of Angkorian art and architect. Discover in deep the history and the culture of this place through our local guide until late in the afternoon. After a breakfast at the hotel, you are free for shopping or relaxing until our driver will drive you to the Siem Reap International airport for departure.